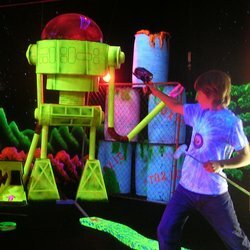 Space Golf Indoor Mini Golf Coupons allows you to receive $2.00 off per person of one round of regular priced blacklight mini golf! Explore 18 holes of black light mini golf all indoors and open year ’round! Located in Orland Park. Course obstacles, scenery, props and even golf balls glow in fluorescent bursts of color! Children and adults marvel at our innovative course filled with alien planets, flying saucers and space creatures! Try a pair of our optional 3-D glasses for an extra challenge! Play exciting arcade games and win great prizes! Enjoy delicious pizza or a hand-dipped ice cream creation in our Sci-fi Cafe and more. Hello, there is a link to the coupon within this post for $2.00 off. http://chicagofuncoupons.com/clmain_view.php?editid1=340.